The opera Norrmalmstorgsdramat (The Drama at Norrmalm Square) is based on a true event. On August 23rd, 1973, a prisoner on leave went into a bank office at Norrmalmstorg in Central Stockholm, armed with a sub-machine-gun and some dynamite. He took three women and one man hostage and demanded that the notorious, imprisoned criminal Clark Olofsson be brought to the bank. In addition to this, he asked for three million Swedish crowns, bulletproof vests, helmets, two pistols and a car to escape with. Clark Olofsson was taken to the bank and let in, against the orders of the Minister of Justice and the Prime Minister. The robbers and the hostages then barricaded themselves in the vault of the bank. Two policemen managed to sneak in and close the door of the vault. On August 26th, the police drilled several holes in the ceiling, through which they introduced gas on August 28th, this forcing the robbers to capitulate. On two occasions during the drama, the two robbers and two of the hostages talked on the phone with Prime Minister Olof Palme, who infamously said to one of the desperate hostages ‘Isn’t it nice to have the privilege to die on duty?’ Fortunately, no one was killed or injured – apart from two policemen who were hurt when one robber fired through one of the holes in the ceiling. He was sentenced to 10 years imprisonment, after which he moved to Thailand for some years. Back home he settled in his hometown and where he started a company of his own, which he is still running. Clark Olofsson, on the other hand, was found not guilty of robbery, since he maintained that he had only protected the hostages. But he continued his criminal career and has spent more than half his life in various prisons. The drama at Norrmalmstorg attracted much attention nationwide through massive coverage on the radio and television. Part of the aftermath of the drama was the coining of the term ‘The Stockholm Syndrome’, which implies that the hostages may side with their kidnappers against the police if they fear that potential police action could be more threatening than that of the kidnappers’. 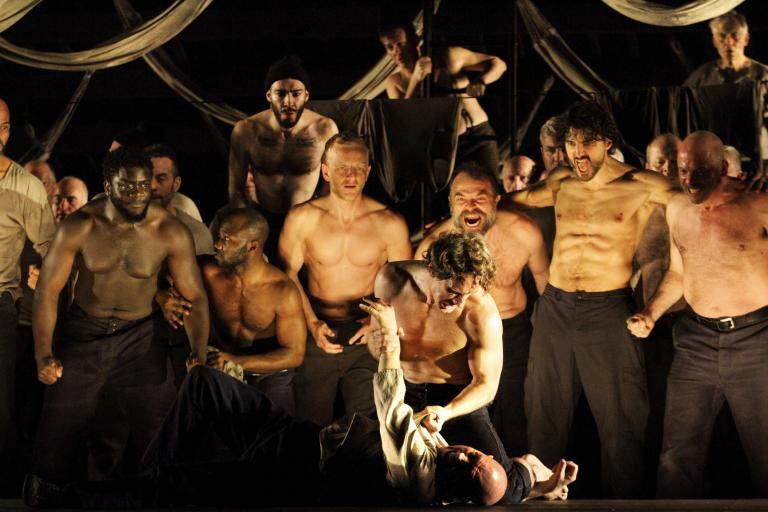 The psychological relations between the hostages and the robbers are a central theme in this opera – and indeed the main reason for making the opera at all. The external frame, the dramatic episodes with the hold-up and some shooting are of course just as thrilling as in any verismo opera, Tosca or Cav & Pag for instance, but it is the reactions of the hostages, the fear, the uncertainty and also the controversies between Clark (the only character whose real name is retained) and the robber. One particular character here is Gunilla, who was the one person who never said anything about her experience after her release – she changed her name and became a recluse. Hers is a mute role in the opera but she expresses herself through dancing, magically performed by Anna Näsström. The libretto is taught, with no longueurs, and the drama, which in real time took six days, is condensed to two hours. The first thing you notice when arriving at the concert barn is an authentic, model 1971 police car, several orchestra members wearing police shoulder belts and a black-and-white panorama photo of Norrmalmstorg projected onto the curtain. When the music begins, the camera zooms in on the entrance of the bank office, and then we meet the robber preparing his attack. The music is threateningly ominous – and off we go! Albert Schnelzer, who studied composition in Malmö and at the Royal College of Music in London, has established himself as one of the most successful Swedish composers, also internationally. I have not heard very much of his oeuvre so far, but what I have heard has appealed to me. And this is also the case with the present score. Basically tonal, it is varied and closely tailored to the dramatic development. Stylistically it is melodious minimalism in the John Adams mould. Think Nixon in China and you are not too far off the mark. Rhythmically intense it certainly is, and when the robber dances with Gunilla they do so to a ‘tango macabre’, music that is also heard when Clark appears and changes everything, liberating the women. There are several solos, arias if you like, very cantabile, not least for the male hostage Leif, winningly sung by Tobias Westman, whose lyric solo ‘Why doesn’t he shoot?’ is one of the highlights. Towards the end of the opera, when the chemistry between the characters is established, even the nervously aggressive robber relaxes and reveals that he had wanted to be a singer. And then he sings something that every Swede at that time knew and loved, namely a song by Evert Taube – and everybody joins in! Youngsters today have probably never heard of him. At the end of the opera, when the hostages are rescued and Clark and the robber have given in, there is a kind of prologue, chorale-like with soft timpani, almost a funeral hymn – very touching! Let me just add that the more dramatic moments – and there are many – also receive their due in powerfully intense, ‘physical’ music. This score is a triumph in every way. All the other ingredients also work together admirably: Bernd Janusch’s sets (genuine furnishing from a bank vault of the period), Johanna Dahlbäck’s costumes with typical flared jeans and portrait-like masks of Clark and the robber, Jimmy Svensson’s atmospheric lighting of the stale vault, and of course the playing of the Vattnäs Chamber Orchestra, which is a pick-up group assembled for this occasion, under the inspired and inspiring direction of Fredrik Burstedt. Patrik Sörling in the dual role of librettist and director can now also add ‘choreographer’ to his CV. What’s more, he has personal personal memories of the drama: As a boy he happened to bike across Norrmalmstorg before it was sealed off by the police and saw Clark Olofsson being brought into the bank office from a hiding place! The cast were all deeply involved in their roles and conveyed the multiple feelings and emotions of the characters. The heaviest burden fell on Anders Larsson as the robber, and his confrontations with Göran Eliasson’s Clark were dramatic highpoints. Anna Larsson’s Margareta, mother of two small children, was deeply touching in her telephone conversation with them, and young Agnes Auer, giving her operatic debut, was a sensitive and convincing Karin. With this production, Anna Larsson and Göran Eliasson, who run the Concert Barn jointly, can add another triumph to their long list of successes.